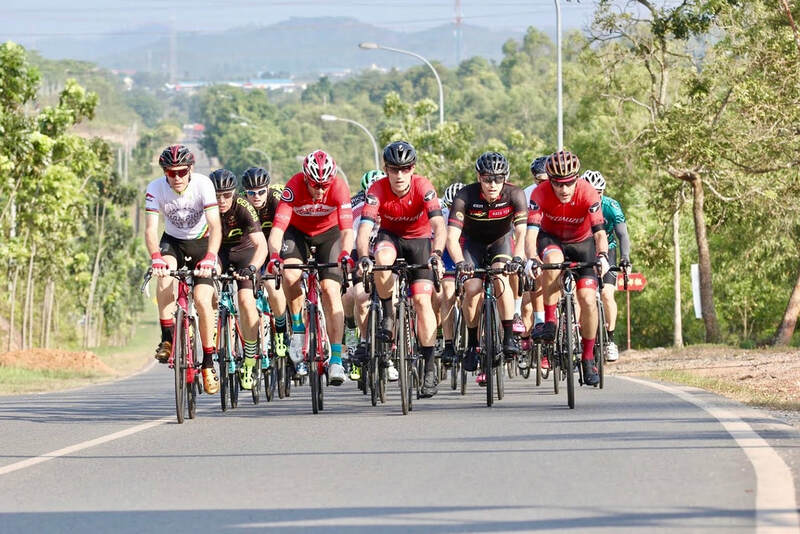 Cycosports have been bringing bike races to the Singapore and wider regional cycling community since 2013, when the then fledgling events company revived the Tour de Barelang, a tough 130km race on the classic Batam Six Bridges course. The three-day Tour de Kepri was the company's second foray into stage racing for Cycosports chief Kent McCallum and his team (they've put on three editions of the Tour of Phuket), and they pulled it off with aplomb despite the obvious logistical challenges they faced with moving 300+ cyclists around the Indonesian province of Riau Islands; or Kepri, which is an acronym derived from the Indonesian spelling, Kepulauan Riau. 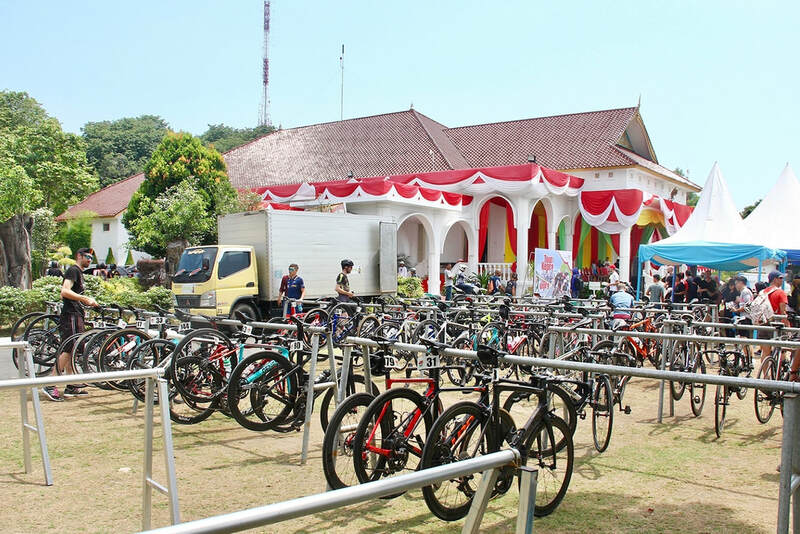 The Tour de Kepri was centred on the two main islands of the province, Batam and Bintan, but also visited seven other islands during the three days of racing. 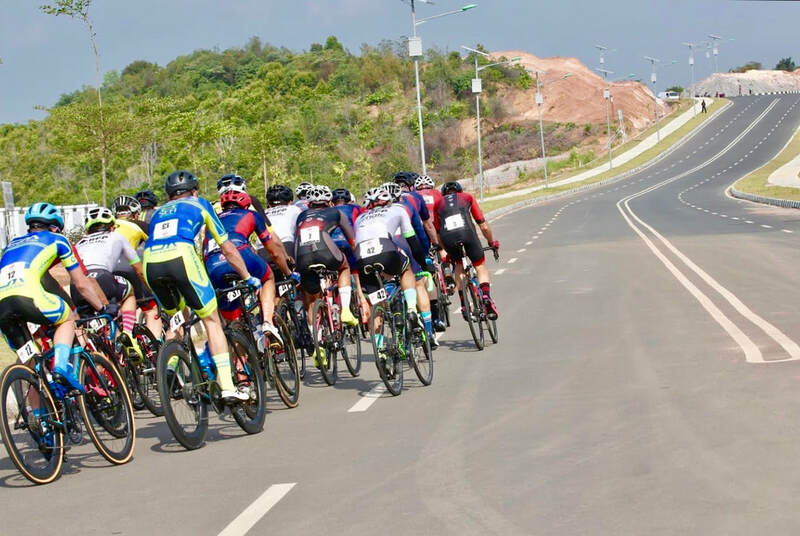 The stages comprised of: the Dompak Criterium, a circuit race on a small island to the south of the regional capital Tanjung Pinang; the Bintan Classic, a 133km road race; and the Barelang Classic, that 130km adventure over the gruelling Six Bridges course. 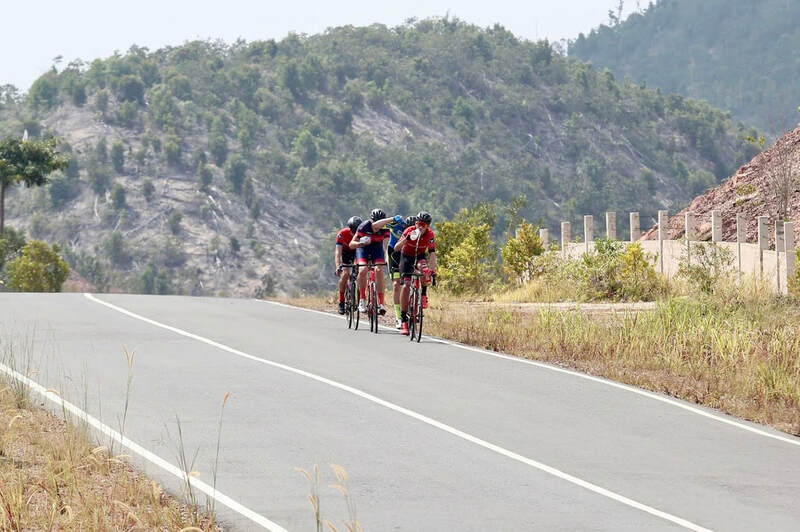 Multiple competitive categories were offered for the full three days, while a day-race option was also an option for the Barelang Classic. For those less competitively inclined, a one- or two-day Tour de Kepri Gran Fondo experience was on the program too. 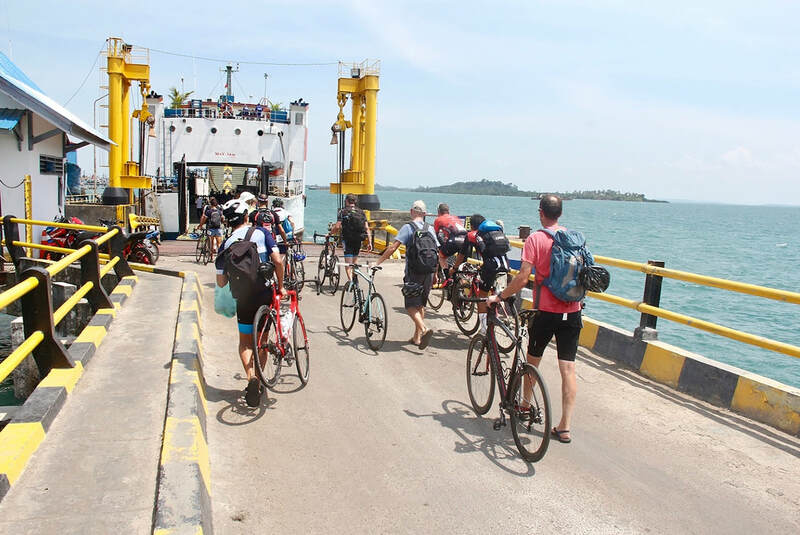 Cycosports has become renowned for its chartered ferries, which cuts out a lot of hassle for the riders, and so the majority of the Tour de Kepri stage racers boarded a ferry boat on the Friday morning for a leisurely two-hour Singapore-Bintan cruise which docked in Tanjung Pinang. On board was of collection of racers representing most of Singapore’s biggest cycling teams/clubs, including Allied World Treknology, Anza Cycling MatadorRacing, Cycling Training CC, Integrated Riding Racing Team, 4T2, Greyhounds, Rapha CC, the Barbarians and the Specialized Roval Mavericks. Many riders from further afield were on the ferry too, including those in the colours of KGB Jakarta, the Australian outfits Velofit Racing and Cyclemania, and Unfound CC from Hong Kong. After a reasonably quick disembarkation, lunch and official tour launch ceremony, the racers headed out in one big convoy to Dompak for the criterium. 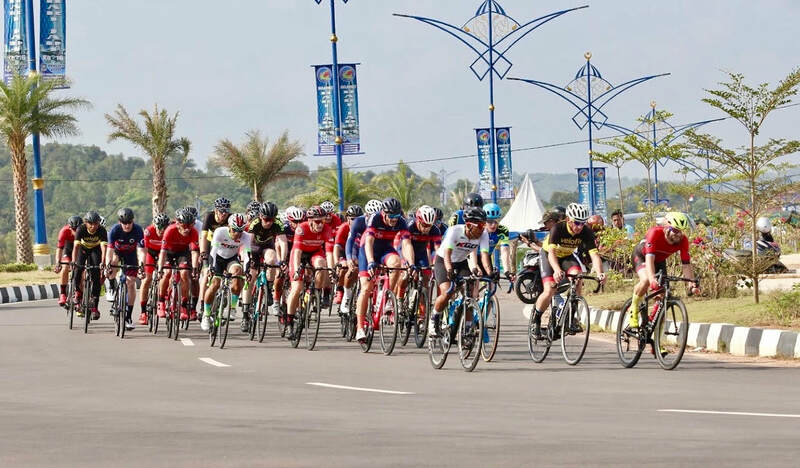 ​Following on from their trial of running two simultaneous crits on adjacent courses at the One North Criterium in April, the Cycosports team did the same again for the Tour de Kepri opener. Dompak sits some 8km south of Tanjung Pinang and aside from a statuesque mosque atop a hill, only seems to feature a small network of wide, well-paved roads … they seemed almost like purpose built for bike racing. The two trapezoid-shaped circuits shared a starting/finishing straight separated by a central reservation and each featured a short, sharp hill that presented a nice kicker on each lap. There were four races in total, with the format “45 minutes plus three laps” for each contest. 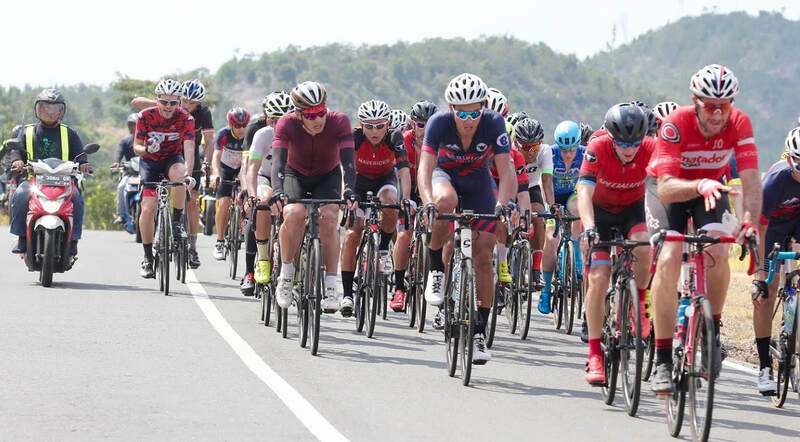 The Men’s Open and Men’s Masters riders raced on the 2.3km-long Circuit A, while the Men’s SuperMasters/Veterans and Men’s Sport/Women’s took on Circuit B, which was slightly longer at 2.8km. In a stacked Men’s Open race, the first few laps featured a slew of attacks, but nothing stuck until a five-man move featuring Caputo, Romain Barbier (Matadors), Jerome Teo (Cycling Training CC), Matt Upton (Velofit) and Bastian Dohling (Mavericks) escaped mid-way through the race. With the five biggest teams all represented, once the quintet had established a decent lead, it was always likely the winner would come from within the break; and so it was. Dohling started the sprint but he mistimed his move as both Caputo and Teo came round him to battle for the stage win, with the Allied World man edging it from the young Singaporean. Dohling held on for third. The bunch finished some 25 seconds behind, but the podium placers were also crucially awarded 10, six and four bonus seconds respectively. Racing at the same time as the Open were the Men’s SuperMasters/Veterans. After a cagey first lap, Alan Grant (Mavericks) attacked the second time up the hill that came just before the start/finish line, but then spent a fruitless four laps out front as no-one from the bunch could be tempted to join him. The middle section of the race was fairly sedate but the contest exploded into action with three laps to go when Team Integrated went to the front en masse. But this tactic didn’t work either and as the race approached the hill for the last time, the field was still together. It was David Strooper (Matadors) who led the charge, as he tore up the slope then down through the fast left-hander to the finish line. His vicious burst of speed was enough to give him a comfortable win over the runner-up Bevan Colless (4T2) and third-placed man Alan Benson (Limerick CC). In the race within the race, Steven Wong (Anza Cycling) took the honours among the Veterans, from Jonathan Earnshaw (YBOC Racing) and Peter Williamson (Anza). Round 2 of the crit action saw the Masters on Circuit A, and like the earlier race on that course, it featured a successful breakaway, but comprising just three riders on this occasion. They were the Unfound duo of Ekapak Nirapathpongporn and James Sutton, and Michael Naert (Matadors). With less manpower, the trio didn’t manage to stretch their lead to quite the same size as their Open counterparts, but they still had a sizeable gap as the bell sounded for the last lap, which they maintained to the end. In a two-against-one situation, the two normally wins, and that was the case in this race, with Sutton crossing the line first, just ahead of Naert and Ekapak. Over on Circuit B, the combined Men’s Sports and Women’s Open/Masters were on track. A group of eight, comprising five women and three men, separated themselves from the rest of the field and went on to contest the finale. Setting the tone for a dominating weekend, it was Chelsie Tan who proved the strongest and she was a clear winner out of the combined bunch. The Women’s Open runner-up was Kate Nelligan (Velofit), followed by her teammate Melissa Robinson. The second rider across the line from the combined field was Han Weicheng, which made him the Men’s Sports champ. Second place went to Thomas Sorensen (Singapore Biking Vikings), with Dave Lommen in third. Christina Liew (Integrated Riding) won the Women’s Masters race from Wendy Yap (Velofit) and Stella Chen He. The 13.5km red road gets its “hell” moniker due to its crocodile-teeth profile, but aside from a 20km coastal section, the rest of the course is hardly ever flat either, with over 1,000 metres of accumulated elevation. Heavy legs were assured, with a roasting equatorial sun thrown in for good measure. For Stages 2 and 3 the Men’s Open and Masters fields combined into one big bunch and the Masters racers must have been cursing their luck as it was a fast, aggressive race from the off. Velofit were the team most prominent in setting the pace in the first half of the race, but try as they might, they couldn’t get any of their moves to stick as Allied World did a great job of defending the yellow jersey. Dohling and Ben Arnott of the Mavs tried their luck on the “red road”, but that bid for glory was thwarted too. 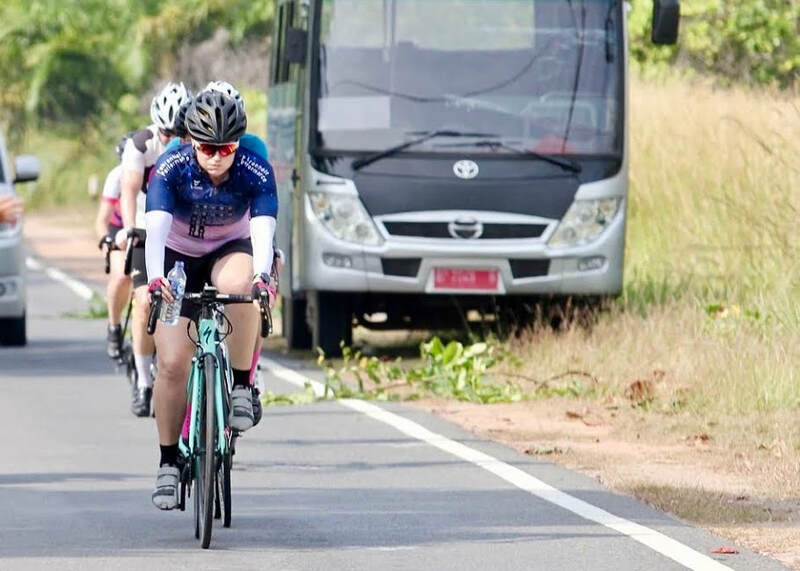 As the race entered the final third along the lower coast of the northwestern section of Bintan, the road was straight and less lumpy and so made it even more difficult for would-be escapees. The outcome was the inevitable bunch sprint finish, but there was a slight sting in the tale as the finishing line came 1km earlier than advertised, which threw a spanner into a few of the sprint-train preparations. Indeed, race leader Caputo is a renowned sprinter, but he ended up only 11th on the day. But quick thinking is an essential element in bike racing and amid the confusion, it was another well-known fast finisher who had the smarts and the speed to take the win, Boon Kiak Yeo (Cycling Training). The Singaporean beat the Indonesian Fajar Surya Hadi Wijaya (KGB) to the line, and with the Malaysian Kelvin Khoo (Matadors) in third place, there was a nice Asean-themed podium for Stage 2. There was no change among the lead players in the GC standings, with Caputo still in yellow. The Masters riders had to mainly follow the Open’s lead throughout the morning, but Naert had a brave but unsuccessful pop off the front a few clicks from the line. After the dust of the mixed-field sprint had settled, it emerged that Raziff Jaafar and Glenn Bull had pulled off a 1-2 for the Matadors, with Pete Hope (Unfound) taking third place. The front end of the Masters GC also remained the same, with Sutton still in yellow. In contrast to the Open race, the SuperMasters/Veterans contest was a day for the breakaway. Stephen Ames (Mavericks) and the Anza duo of Williamson and Lionel Gomes attacked from the gun, and nothing was seen of any of them until the unlucky Williamson was passed on the side of the road fixing a flat around the 60km mark. The other two escapees lasted another 25km before being reeled in. A few probing attacks followed immediately after the catch, but race leader Strooper and his Matadors teammate Dan Smith quickly closed them down. However, with 40km to go the decisive move of the day was struck when Grant shot out of the bunch up the steep slope of a bridge crossing. Dave Kendal (Integrated Riding) and Smith were the only two to react and soon the trio had ridden themselves out of sight of the peloton, although Smith, who was there at the service of the yellow jersey, didn’t contribute. When Kendal dropped off the pace with 15km to go, it was left to Grant power on solo with Smith as a dead weight behind. The lead quickly began to dwindle and if the finish line hadn’t come that 1km earlier than advertised, there’s a good chance the duo might have been caught. But the front two did stay away, with Smith inevitably taking the stage win and with it the yellow jersey. The runner-up Grant moved into second place on the GC for his efforts, six seconds behind Smith, with Benson taking third place in the bunch sprint, some 20 seconds behind the lead pair. Wong took his second straight win in the Veterans, again from Earnshaw and the unlucky Williamson, who punctured two days in a row. The Men’s Sports/Women race was last to set off and it was heartening to see the female portion of the field outnumber the men. Breakaway was the name of the game in this bunch too, and an impressive one at that. The previous day’s winners Tan and Weicheng combined for a long-range effort that saw them break the virtual tape an astonishing eight minutes ahead of the main bunch. Both riders had by now surely built unassailable leads in their respective Women’s Open and Men’s Sports GC races. When the chasing bunch eventually crossed the line, it was Yap at the front as she clinched the Women’s Masters win. Liew was the second-placed Master’s rider, with He third again. Nelligan took her second straight runners-up spot in the Women’s Open, with Dione Wang (Matadors) third. Jesper Soerensen (Singapore Biking Vikings) was the fastest male in the main bunch, which gave him the second spot on the Sports podium. Tom Webster was the third-placed Sports man. 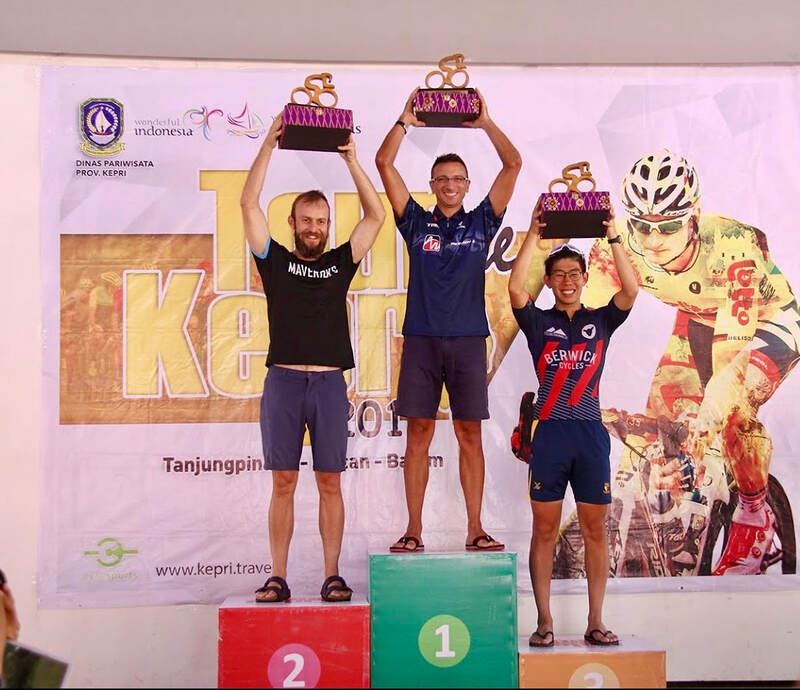 Racing completed, the riders then took a short spin to the port town of Tanjung Ubin for the prize presentation and lunch, before boarding a slow boat for Batam. The 90-minute trip was one of the highlights of the tour, with a talented live band providing some unexpected but appreciated entertainment, while a small squad of therapists administered free foot and calf massages for the weary racers, as they munched on fresh cut fruits. 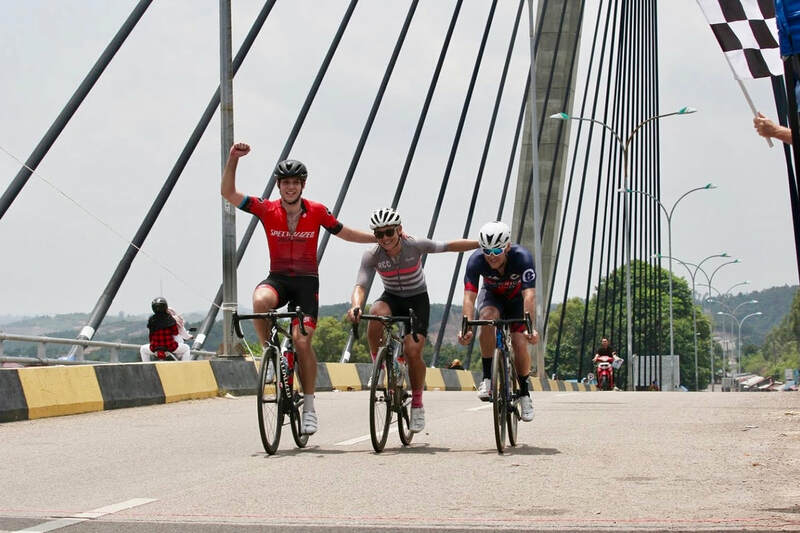 The Tour de Kepri concluded with the Barelang Classic over the Batam Six Bridges route. 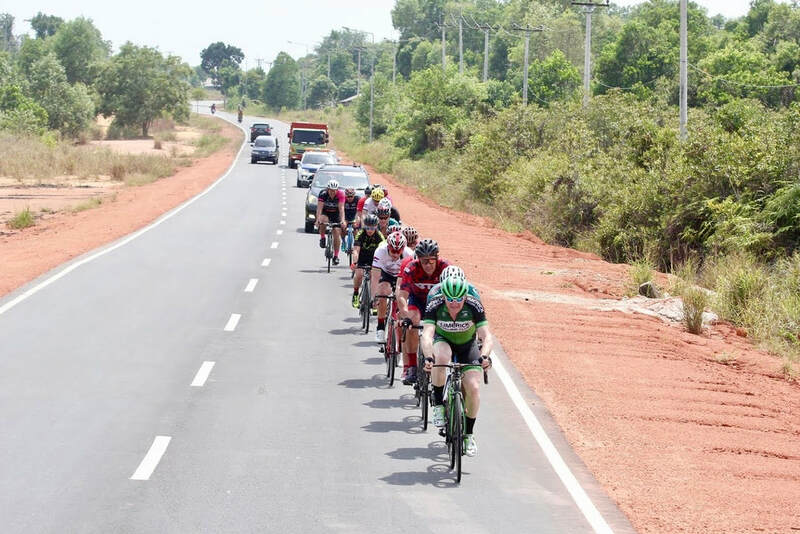 Another day of searing heat and wide open rolling roads lay ahead, but another significant factor was thrown into the mix too; the arrival of a boatload of fresh legs who had signed up to race just the Barelang Classic. While those riders obviously couldn’t compete for the overall tour honours, they were eligible to win the individual prizes on the day, and there was the potential for them to influence the final GC outcome. The Men’s Open field only had a few additions, but the Masters saw their numbers nearly double, meaning there was a bumper bunch on the start line. 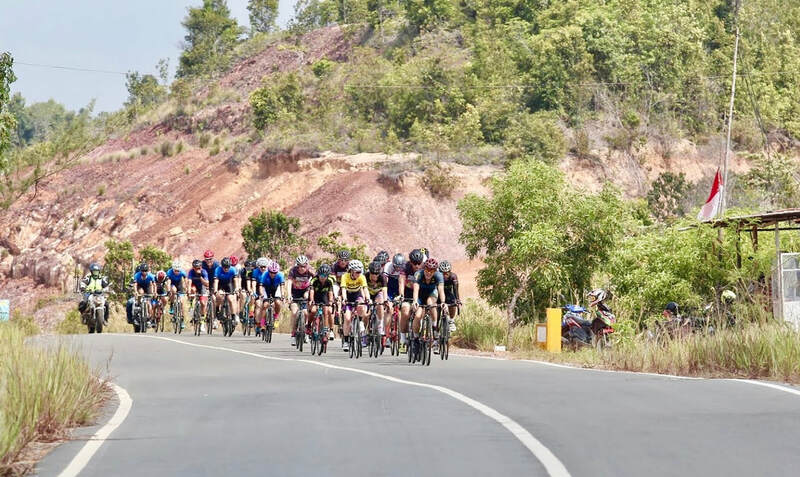 The first 13km of the 130km was neutralised until the course hit the Barelang Highway, a long road that connects Batam to six other islands over the six bridges that give the race its informal name. The road stops at the end of the last island in the string, Galang-baru, and then heads back towards the finish line atop the biggest and last of the spans, the impressive Barelang Bridge. It proved to be an exciting morning of racing, aggressive from the gun, with the speed never really letting up as the other teams led by the rampant Matadors piled the pressure on the yellow jersey and his squad. There was always somebody up the road, but like they had done on Stage 2, Allied World were up to the task, led by the twin diesel engines of Pierre-Alain Scherwey and Reuben Bakker on the front. It sometimes took them a while to bring back the breaks, but they always eventually did. The Mavericks and Velofit again set up the most threatening of the breakaway attempts, but Scherwey jumped across to the move instigated by the former when it went just before the U-turn, and then a Velofit move with 30km to go was slowly but surely reeled in. And so it was down to another bunch sprint, but this time it was a 300m drag up the steep slope to the apex of the Barelang Bridge. It was a chaotic affair that saw the strung-out bunch led by a rampaging Daniel Griffiths (Cyclemania), the Perth-based rider taking the win by just edging Stage 2 champ Yeo out of a double. Third place went to Yusuf Kibar (KGB). Caputo finished in sixth place, a result that clinched the overall title, for the Italian. The action behind him resulted in a minor reshuffle on the podium, as Dohling put a few seconds into Teo to switch places with him from second to third on the final GC. Post-race, the winner was a happy man. He’s a fan of the new race, especially for its inclusion of a crit. “Yeah, crit is definitely better for me for my characteristics rather than an ITT. Usually in this part of Asia you always have an ITT as an opener which doesn't really suit me much, so I looked at the crit and I knew I might have some chances. And I was lucky to be in the right break and my sprint was better than the others, so I was lucky there as well,” Caputo said. "The race is very good and the organisers are amazing. We were hopping on and off different islands so the logistics for 300 people is a big challenge and they managed really well so congrats to Cycosports,” he said. In the Masters contest going on amid the Open battle, the yellow jersey of Sutton stamped a final authority on the race by clinching his second win of the tour. His Unfound teammate Ekapak took his second podium of the race as Stage 3 runner-up and the six bonus seconds he earned duly moved him up to second place on the GC. Bull was third on the day, with his fellow Matador Naert taking the third spot on the final overall leaderboard. The SuperMasters/Veterans race was also bolstered by a substantial number of day-race riders, and two of them, Trent Illife (Mavericks) and Earl Icalina (Team TXR), set off when the flag dropped and weren’t caught until over 100km later. The Matadors chose not to chase them as they weren’t on the GC and with nobody else in the “chasing” bunch prepared to sit on the front, the pace was mostly tortoise like for most of the outward leg. Only when calculating at the U-turn that the leaders had a six-minute advantage, did the pelton snap out of its reverie. Led mostly by the day-racers and aided considerably by a tail wind, the speed ratched up dramatically and with 25km to go the gap was down to two minutes. The break was doomed and it was eventually caught with less than 10km to go, but not before Colless of 4T2 made a brave long-range attempt to bridge over and then press on solo. His effort was also in vain, though, as a by-now rampant peloton sniffed glory on the Barelang Bridge. ​The bunch was spread out as it rounded the final corner to the lower slopes of the bridge, with one of the day-racers, Brian Johnsen (BikeLabz Racing), at its head, followed closely by Strooper, Benson and Grant in that order. With the GC still up for grabs and bonus seconds of vital importance, that quartet opened up a gap on the rest as they powered for the line, but the order remained the same with Johnsen taking the chequred flag and the other three following him in a vertical line. Race leader Smith lost a few seconds to Grant on the climb, but with the Mavericks rider fourth on the day and failing to grab any of those bonus seconds, the Matadors man clinched the overal title. It was close, though, with Grant just two seconds behind and Strooper only three seconds further back in third. Spare a thought for Benson, who finished fourth on the GC despite placing third on each of the individual stages. The Veterans race was also affected by the day-racing contingent as Don Humphrey (Anza) took a clear win. Indeed, Humphrey was one of the driving forces driving the combined peloton after the U-turn, and while he finished with the main bunch, his Veterans rivals were all dropped, handing him an uncontested triumph. Williamson eventually took second place on the day, with Wong in third. Wong also clinched the GC title from Earnshaw and Williamson. In the Sports/Women’s race, a huge influx of riders doing the one-day challenge completely transformed the characteristics of the racing. All three podium places in the Sports contest went to the day-racers, led by Benchi Klaver (Greyhounds), who broke away from the lead bunch with Noor Hazim Suliamee. Then Klaver eventually dropped Suliamee to take a solo win by a two-minute margin. Wee Siong Chua (Team West Coast) led the male riders in the peloton home another two minutes later to claim third place. Yellow jersey wearer Weicheng was fourth in the Sports and thus claimed the overall title with ease. Soerensen and Webster also finished in the bunch to keep their second and third spots on the final GC. Tan of BikeLaz confirmed she was in a different class in the Women’s Open by claiming her third straight stage win. Indeed, she led the combined peloton over the line, only beaten on the day by the two fresh-legged, breakaway men. Robinson took her second podium of the weekend as runner-up, with teammate Nelligan just behind in third. The two Velofit riders swapped those positions on the final GC, with Nelligan second behind Tan, and Robinson third. The Women’s Masters Stage 3 win went to Liew, with Yap again second and He in third. The order was the same on the final GC, providing yet another triumph for Liew to add to her illustrious palmares. Women’s Open champ Tan, a triathlete of some note before she made a fairly recent transition to concentrate on cycling, was delighted with how the weekend played out. “It’s good, it's the first win for me in a stage race like this. I haven't been to a real stage race like this before. All the other races I have done have just been one-day challenges,” said Tan, who also revealed that her eight-minute win on Saturday inspired her to try again on Sunday. “I tried to break away but the Aussies were marking me really closely so I just waited to the 300m sprint and that's where I just went for up it to the finish line,” the Singaporean said. Asked for her thoughts on her first stage race, Tan said that “the organisers are doing a great job and the logistics were quite nicely planned and I think all the other cyclists are helping the organisers by being very cooperative as well”. While she enjoyed racing alongside the Sports cat men, she hopes even more women will take the step into competitive cycling. “Just get on the road and start cycling. Joining a group will really help you, getting yourself in a group of cyclists will make it easier,” was her advice to would-be female racers. 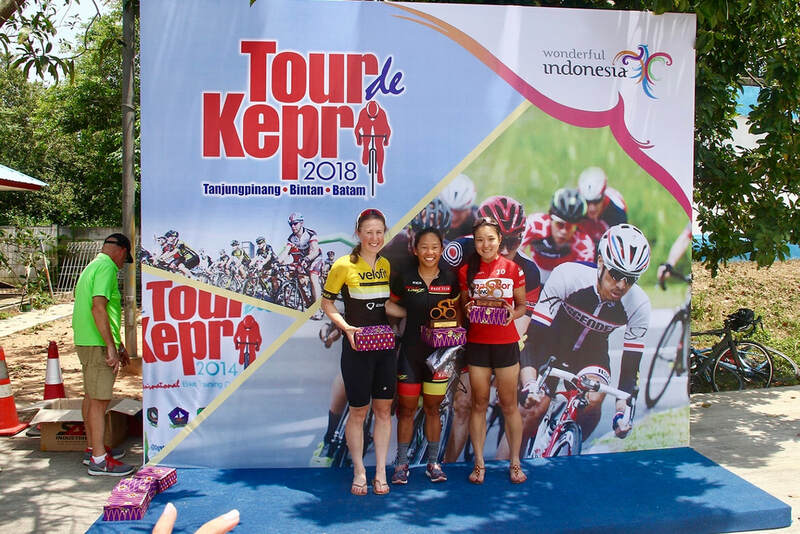 With around 20 women riders across the two competitive categories and many more among the 140 riders who rode the Barelang Classic Gran Fondo on the Sunday, the Tour de Kepri did a great job in attracting women to have a go at bike racing. But more importantly in the eyes of the seasoned roadies, the Tour de Kepri brought another avenue for them to get their racing fix. After an impressive debut, the race is sure to become bigger and better as it grows in the years ahead. Cycosports chief McCallum sees that as a likely outcome. "It was definitely the toughest event we've put on in terms of logistics, but all the different organisational teams pulled it together to deliver a memorable event that we hope will build into something iconic," McCallum said. Photos courtesy of Ricky Wihendar/Cycosports.